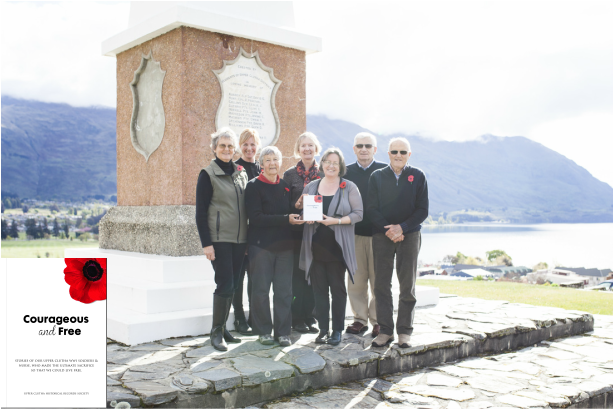 ​"STORIES OF OUR UPPER CLUTHA WW1 SOLDIERS & NURSE, WHO MADE THE ULTIMATE SACRIFICE SO THAT WE COULD LIVE FREE"
“Courageous and Free” is the result of two years research by five members of the Upper Clutha Historical Records Society and Wanaka Genealogical Group. It not only relates the stories behind the names listed on Upper Clutha War Memorials but also uncovers the names and stories of many other soldiers not previously recorded. In some cases living family members were able to be traced, which resulted in the most wonderful resources of last letters and postcards home, photographs, family stories and wills. It is anticipated the information uncovered will be of interest to families, local historians and anyone who has an interest in history within the Upper Clutha District. Furthermore the book will provide a significant historical resource for libraries, schools, RSA’s and other interested groups. Many thanks to our funders without whom this project would not have been possible - The Graham and Olive West Charitable Trust (research), The Hawea Dip Charitable Trust, Otago Community Trust, and Lottery Grants Board (publishing). Once the order is received an email will be sent giving details of how to make the payment. Postage plus a book will be $25.00 to a NZ address. Postage plus a book to an overseas address will have to be individually ascertained from NZ Post and the purchaser will be advised by email of the total payment required. ​On receipt of the cheque/payment the book will be posted.